If salmon fly selection was so vital for catching fish then I doubt they'd be thousands of different fly patterns out in circulation. In saying that we all have developed firm favourites for certain times of the year and here's an insight into what I've personally done well with. The 'Copperass' is an out & out deadly salmon pattern which was derived from the also deadly Ally Shrimp 'Cascade'. The difference between these 2 patterns is a copper UV varnished body, full Arctic fox tail and wing & 2 strands of long gold holographic tinsel tied into the wing. I've seen me give this pattern to a fellow anglers to use on numerous occasions who had salmon seize it more or less 'instantly' and on one occasion on the famous River Tay Lower Kinnaird beat a perfect 17 pounder rose to this fly after ignoring the fishing friend's perfectly tied Dee Monkey which had been fished in front of it. 75% of my fishing time is spent swimming one of these whether it be tied on a 2 inch copper tube for early Spring or a tiny size 13 for the lowest of low Summer water conditions. This beautiful orange and red salmon fly is a WMD through late Summer and the Autumn months on the Scottish salmon rivers and was created while I was working as a Head Ghillie on the Tay back in 2003. Even our grand master of Scottish salmon fishers Paul Young used to swear this fly was in a class of its own of which I obviously agreed with as its designer! Although favoured as a late Summer and Autumn fly it will work throughout the season if fished but I'm guilty of favouring the 'Copperass' for the first 2 thirds of the season as I've way too much faith in the 'Copperass' to change it over unless I want to really try to upset a specific fish via psychological shock tactics! These 2 killer patterns played the biggest part in establishing my unshakable addiction to salmon fly fishing during the 70's on the Tay and the once prolific West Coast River Fyne. The 'Blue Charm' was the only fly West Coast ghillies would carry in their fly boxes back in those days before aquaculture obliterated the West's wild stocks. I recall one morning of 9 salmon between 2 of us during the 1st week of September on falling spate water on this fly and every fish was caught on 9ft trout rods. On the Tay I vividly recall landing my first salmon for a guest in 1976 which took the 'Silver Stoat' wearing my father's Milbro chest waders that came up to my chin and a rope tailer which shouldn't have stuck on that 6lbs grilse but thankfully it did! These 2 deadly salmon fly patterns are often forgotten these days but make no mistake about the fact that salmon haven't changed their views on these 2 even if some of the tackle dealers have been distracted! 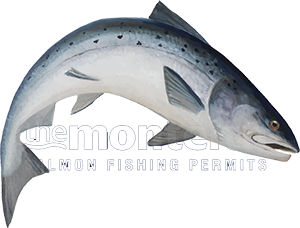 Make your salmon fly selection decision in the morning based on the prevailing water and light conditions and stick with it unless the water or light changes significantly. The time to change a salmon fly is for the afternoon session if you're back onto the same pools and you know you're covering fish. From what I've seen more often than not it's not the fly that necessarily needs changed but the speed and depth of its flight path over the salmon lies. Once you've got total faith in any salmon fly pattern (as I have in the above 4) stick it out and your faith will highly likely be replenished! Changing flies too often only depletes faith levels and reduces salmon fly swim time. If there's a 'taker' about and you're covering it properly then nine times out of ten it will come for your fly. For supply of any of the above salmon fly patterns (tied correctly) contact Danny McLaughlin on danny@justsalmonflies.co.uk or via telephone on; + 44 (0)7446 353058.